Step 1 Heat a large saucepan and dry-fry the cumin seeds and chilli flakes for 1 min, or until they start to jump around the pan and release their aromas. Scoop out about half of the seeds with a spoon and set aside. Add the oil, carrot, lentils, stock and milk to the pan and bring to the boil. Simmer for 15 mins until the lentils have swollen and softened. Step 2 Whizz the soup with a stick blender or in a food processor until smooth (or leave it chunky if you prefer). Season to taste and finish with a dollop of yogurt and a sprinkling of the reserved toasted spices. 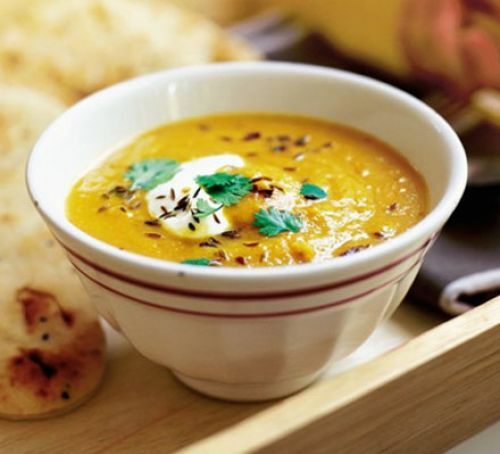 Serve with warmed naan breads. Place half the cumin seeds, half the chilli flakes, the oil, carrots, lentils and 700ml stock into your slow cooker pot. Cover and cook on High for 3 hours until the lentils are tender. Dry-fry the remaining cumin seeds and chilli flakes just until fragrant. When the lentils are done, stir in the milk and whizz up the soup depending on how chunky you’d like it. Substitute the chilli flakes and cumin seeds for a few teaspoons of harissa paste. You could add cooked shredded chicken at the end of cooking, too. For a richer but dairy-free alternative, use a can of reduced-fat coconut milk instead of the milk.